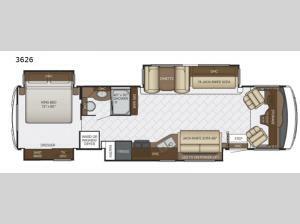 Take to the road with this easy to use Bay Star class A motor home. With quad slide outs you can easily travel with a few extra guests. After you set up camp for the night then come inside and enjoy watching a little TV in the living room while relaxing at the 74" jack knife sofa or at the 68" jack knife sofa. Both sofas and the dinette can convert into additional sleeping space, if needed. In the rear bedroom there is a king bed plus across the room enjoy watching TV or you will find extra storage with the dresser and shirt wardrobe.